Pharmacists urge the public to make vaccination a priority so they don't miss out! TORONTO, Oct. 15, 2015 /CNW/ - Each year flu season hits millions of Canadians and sends thousands to hospital. And, each year medical experts encourage Canadians to protect themselves by getting a flu vaccination. According to a new national poll, that message is still not sinking in – 54 per cent admit they are unlikely to get the flu shot this year. So pharmacists are working to set the record straight and encourage the public to make it a priority. Since the evidence clearly shows the benefits of flu vaccination, what is keeping Canadians from committing each year? Last year's flu season saw questions arise over how effective the vaccine was; could that be the culprit? Not according to the poll – in fact, four in five Canadians (83 per cent) say the limited effectiveness of last year's flu vaccine won't affect their immunization decision this year. One major stumbling block is that many Canadians seem to be confused about how important flu vaccination is – 81 per cent think washing your hands is the best way to protect against the flu, while only 47 per cent thought getting the flu vaccination offered the best protection. Almost half (47 per cent) mistakenly believe there is no need to get the flu shot every year. "The flu vaccine is hands down the best source of protection currently available," says Dr. Vivien Brown, family physician and representative to Immunize Canada, a national coalition which raises awareness about the benefits of immunization. "And with the flu vaccination now conveniently offered from pharmacists across many parts of Canada, it's easier than ever to make flu immunization an annual routine." The research found that men and women see things differently when it comes to the flu and vaccination. Women are more concerned with getting the flu than men – 48 vs. 37 per cent. And yet, 33 per cent of women say they have never received a flu shot, compared to 28 per cent of men. What's more, 50 per cent of women mistakenly believe there is no need to get the flu shot every year, while only 44 per cent of men have that misconception. In addition to the serious health risks, the flu is also a major nuisance for many and provides a significant disruption in our daily lives. Fever and other symptoms can usually last up to 7 to 10 days, but the cough and weakness may last 1 to 2 weeks longer.ii The poll found that the following are the top three things Canadians hope they don't miss out on due to the flu: family holiday dinners (49%), social events (47%), and work (46%). "No one wants to be stuck sick in bed and missing out on things like family holiday celebrations or even important work deadlines," says Bhavika Prajapati, Shoppers Drug Mart pharmacist. "Pharmacists are trained medical professionals and in most provinces we offer flu vaccination during all open hours and without an appointment." Strengthen your immune system: Maintain a healthy and active lifestyle and don't forget to stay hydrated. Practice good hygiene: Wash your hands frequently, and for at least 10 seconds using warm water. Pharmacists are now able to administer the flu vaccine in all provinces in Canada except for Québec*. And new this year, Ontarians aged five to 17 now have an additional option to the flu injection for their immunization since FluMist®, a nasal spray, will now be available at pharmacies across the province. Influenza activity normally occurs from November to March or April. Fall is the best time to get the flu vaccine as it takes up to two weeks to build immunity after a flu shot and protection will last roughly six months. Shoppers Drug Mart Corporation is one of the most recognized and trusted names in Canadian retailing. The Company is the licensor of full-service retail drug stores operating under the name Shoppers Drug Mart (Pharmaprix in Québec). With more than 1,256 Shoppers Drug Mart and Pharmaprix stores operating in prime locations in each province and two territories, the Company is one of the most convenient retailers in Canada. The Company also licenses or owns 50 medical clinic pharmacies operating under the name Shoppers Simply Pharmacy (Pharmaprix Simplement Santé in Québec) and six luxury beauty destinations operating as Murale. As well, the Company owns and operates 62 Shoppers Home Health Care stores, making it the largest Canadian retailer of home health care products and services. In addition to its retail store network, the Company owns Shoppers Drug Mart Specialty Health Network Inc., a provider of specialty drug distribution, pharmacy and comprehensive patient support services, and MediSystem Technologies Inc., a provider of pharmaceutical products and services to long-term care facilities. Shoppers Drug Mart is a unique and independent operating division of Loblaw Companies Limited. From August 21st to August 22nd, 2015 an online survey was conducted among 1,513 randomly selected Canadian adults who are Angus Reid Forum panelists. The margin of error—which measures sampling variability—is +/- 2.5%, 19 times out of 20. The results have been statistically weighted according to education, age, gender and region (and in Quebec, language) Census data to ensure a sample representative of the entire adult population of Canada. Discrepancies in or between totals are due to rounding. i Public Health Agency of Canada. Public Health Reminder: Seasonal Flu. Available online at: http://www.phac-aspc.gc.ca/phn-asp/2014/flu-grippe-1022-eng.php. Accessed September 2015.
iii The Centre for Family Medicine. Stop the Spread of Influenza. 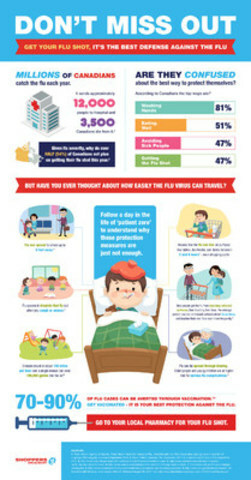 Available online at: http://family-medicine.ca/sites/www.family-medicine.ca/files/influenza_bro_eng_web_final_oct25.pdf. Accessed September 2015.
iv Public Health Agency of Canada. Public Health Reminder: Seasonal Flu. Available online at: http://www.phac-aspc.gc.ca/phn-asp/2014/flu-grippe-1022-eng.php. Accessed September 2015. *please check provincial regulations for specific information on eligibility.